The Local Buzz - at Hicklebee's of course! Hicklebee’s is an independent bookstore in Downtown Willow Glen (a district of San Jose, California) which has been catering to the reading tastes of its community for over 30 years. That type of longevity is remarkable for any business, but especially for a book shop in the age of Amazon.com. What is their secret? Mary Ann Hill, the curator of Hicklebee’s popular Local Author Program, credits Hicklebee’s success to the store’s focus on local support of the community and businesses as encouraged by Valerie Lewis (Hicklebee’s original and current co-owner, together with her sister, Monica Holmes). The emphasis on “local” benefits local authors too. In addition to the thousands of well-known book titles carried by the store, Hicklebee’s tenders books independently published by San Francisco Bay Area writers. Without a large publishing house to arrange publicity and advertise a book’s existence, independent authors stand little chance of seeing their creations on store bookshelves. The inventory of behemoth bookstores like Barnes & Noble or, until recently, Borders has traditionally been dictated by corporate headquarters: the public is offered books from The New York Times best-seller list, volumes by the most well-known and popular authors, and new publications deemed “worthy” by the publishing industry. Small publishing houses or self-published works are left struggling for attention. Responding to requests from these grappling authors, Hicklebee’s launched their Local Author Program in 2008, offering talented independent writers a chance to have their books on store shelves, generate buzz about their creations, and meet the book-buying public, just as any well-known author might do. Now, nearly five years later, Hicklebee’s boasts 25 authors participating in their Local Author Program. One of them is Julie Jackson who, along with her husband Scott, createdGreat Giants Stories Every Young Fan Should Know (true stories about the World Champion San Francisco Giants). Jill Zabkar Martin, author of Froggy Boots Go With Everything, is a veteran of Hicklebee’s Local-Author Program after several years of participation. Some Local Author Program participants such as Michelle A.B. McKenzie (Beaver’s Big Problem and Beaver’s Big Discovery) and Linda Ulleseit (Novel Central 2 and On a Wing and a Dare) boast multiple volumes at Hicklebee’s. The most famous of Hicklebee’s Local Author Program alumni is Jennifer Fosberry, whose “Isabella” series (My Name is Not Isabella and Isabella: The Star of the Story, among others) has since been picked up by a big publishing house. The photo to the above right is the original sign from Hicklebee’s previous location – which was exactly the width of this sign! The details of Hicklebee’s Local Author Program are in a brochure available through their website, in their newsletter, and at the end of this article. Or you can learn more about the program as the authors of Great Giants Stories Every Young Fan Should Know did: drop by the store. That’s how the program started, after all: authors visiting Hicklebee’s to request a review and placement of their book. When Great Giants Stories was released in 2011, Scott and Julie Jackson went looking for venues to carry their creation and found Hicklebee’s with its youthful clientele (the perfect audience for their book) and Local Author Program. The Jacksons became participants. Julie has been thrilled with the results: Great Giants Stories is one of Hicklebee’s best selling consignment books. In fact, Julie claims that her consignment sales at Hicklebee’s (and elsewhere in the area) outpace the book’s sales on Amazon.com. 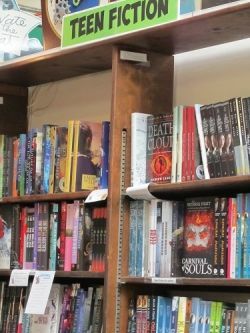 Although bookstores in the San Francisco Bay Area will accept select self-published works on consignment (usually those with obvious local appeal), few of these stores have a formal program specifically designed to promote the works of local authors. Having published my own book, Embracing the Elephant, in August of 2012, I found placing my historical fiction adventure in Bay Area stores, despite its California-centric subject matter (the California Gold Rush), to be a challenge – most stores reserve coveted shelf space for books with novelty appeal or big-publisher backing. I learned about Hicklebee’s Local Author Program by accident: my friend Diane (who lives in Willow Glen) knew of my quest to get Embracing the Elephant on bookstore shelves. After reading an announcement in her local newspaper of an author event at Hicklebee’s, Diane called me with the news. I attended the event, met Mary Ann, and nowEmbracing the Elephant is among the books offered at the store (its golden spine can be seen on the upper left shelf of the picture above). Not all entries are accepted, however. In her role as curator, Mary Ann conducts a rigorous review of the submitted books to ensure the quality of production and determine if it is the type of book Hicklebee’s wants to carry, given their clientele. Once accepted, however, Local Author Program books are given special treatment. Mary Ann places “Local Author” stickers on the books themselves, creates “shelf talkers” (stickers attached to the shelf that provide additional information about the book) and, prior to the Author Events, highlights the books by placing them in one of the large front windows of the store. To augment the program, she is contemplating a “Local Author Corner” and briefings to the Hicklebee’s staff on the subject matter and availability of these home-grown productions. For an additional $100 authors can participate in Local Author Events held by Hicklebee’s up to 4 times per year (depending upon interest from the authors). Here, 3 to 4 local authors meet the public, talk about their creation, give short readings, and sign books. Prior to the event, local-author books are featured in Hicklebee’s store window. 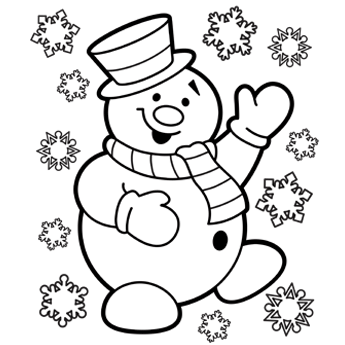 The fee covers the cost of the event, including announcements via Hicklebee’s email newsletter (which is distributed to a readership in excess of 4,200), on the Hicklebee’s website, and in local newspapers. For those authors who might be intimidated by the fee, it is important to note that big publishing houses pay for advertising and special displays whenever an author they represent attends any local event. Originally a children’s bookstore occupying a narrow box-car sized shop on Lincoln Avenue, when Hicklebee’s moved across the tree-lined street to its present location (1378 Lincoln Ave, San Jose, CA), they more than doubled their square footage and their inventory. Inside, Hicklebee’s is vibrant with color and eye-catching cutouts of popular book characters: a testament to its roots as the purveyor of children’s books. However, due to customer demand, they now boast an ever-increasing portfolio of select adult and young adult books. It is that customer demand, and the staff’s willingness to listen and respond, which has helped Hicklebee’s overcome the turmoil of both the economy and the publishing industry. While nearby big bookstores like Borders and Barnes & Noble have come and gone, Hicklebee’s remains. 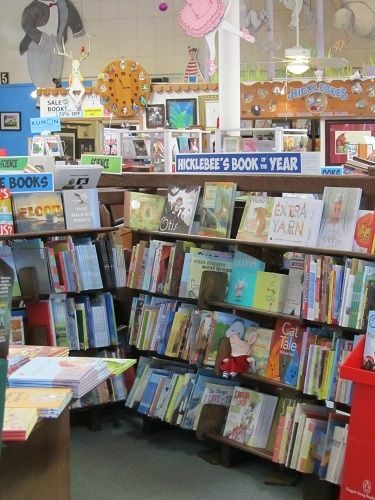 When Willow Glen Books, also on Lincoln Avenue, shuttered its doors three years ago, Hicklebee’s expanded its catalog to address the needs left by such bookstore closures. 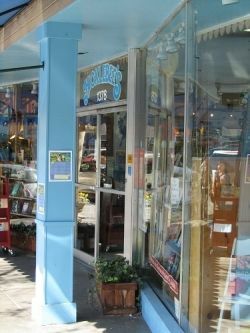 Hicklebee’s cheerful blue awning is a beacon of welcome for readers of all ages – buzzing with the vibrancy of community. Buzz by Hicklebee’s – Virtually, then Physically! If you liked this lens…click here.